MANILA – A non-government organization serving the Filipino workers urged the Duterte administration to raise the issue of Sumifru workers to the visiting top diplomat of Japan. Japanese Foreign Minister Taro Kono made a courtesy call to President Rodrigo Duterte in Davao last Saturday, February 9. The Japanese diplomat’s official three-day visit (from February 9 to 11) had been scheduled on the sidelines of the Association of Southeast Asian Nations (ASEAN) Foreign Ministers’ Meeting (AMM) and Related Meetings held at the Philippine International Convention Center in Pasay City on August 8, 2017. During Kono’s visit in the Philippines he attended to the inauguration ceremony of the Japanese Consulate General in Davao. But absent in the list of his concerns in this visit was the issue of the striking workers of the Japanese company Sumifru (Sumitomo Fruits). When this three-day visit was scheduled, his agenda as announced included Japan’s support in the Philippines’ fight against terrorism in Mindanao, Japanese assistance on infrastructure development, measures against illegal drugs, public safety and counter-terrorism, and other matters concerning the Korean peninsula. “Minister Kono affirmed Japan’s support for peace and stability in region, but was silent on the labor rights violations, red-tagging, violent dispersals and murder of banana plantation worker Danny Boy Bautista in connection with Japanese multinational company, Sumifru Corporation,” said Rochelle Porras, Executive Director of labor NGO EILER, Inc. 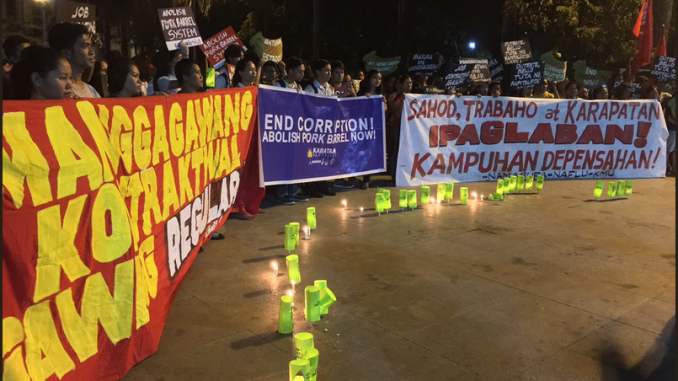 The labor NGO lamented Kono’s silence on Sumifru Corporation’s “serious damages to workers’ communities” in Mindanao and his visit’s “palpable lack of empathy” with the case of Nagkahiusang Mamumo sa Suyapa Farm (NAMASUFA) workers union. As of this writing the Namasufa union members are holding a peaceful campout at Liwasang Bonifacio. They went on strike late last year, but their picketline in Compostela Valley was violently demolished, the residence of their union officers and their union office ransacked and some were burned down. The labor NGO emphasized that the right to strike is a fundamental human and trade union right protected by laws and international conventions particularly ILO Conventions 87 and 98 both ratified by the Philippines in 1953, and Japan in 1965 and 1953 respectively. The workers’ union in Sumifru has protested the Japanese fruit giant’s treatment of workers, the extensive contractualization, and the way martial law in Mindanao is being used to crush legitimate workers’ protests and strikes. Prior to the violent demolition of their October 2018 strike, the Sumifru workers had launched victorious strikes. The giant Japanese company has a record of union-busting attempts which the workers said are meant to allow it to continue its profitable use of low-paid contractuals. Bringing the issue of their current strike in Manila, where there is no declared martial law, they continue to receive threats from the city government about demolishing their campout. The Manila city government eventually relented and allowed the campout in Liwasang Bonifacio up to February 25. “President Duterte and Minister Kono did not discuss the accountability of both governments, DOLE, Davao region LGUs and Sumifru Corporation in recognizing the collective bargaining and trade union rights of Sumifru workers. Worse, they turn a blind eye on human rights violations in the business operations of the exporting giant,” Rochelle Porras said. The Sumifru workers launched a strike to demand their regularization on the job and living wages. “Minister Kono said that Japan supports efforts to revitalize economic activities in the region. He should also underscore the protection of the workers, who are the life and driving force of the region’s economy,” Porras said. Sumifru Corporation controls 30 percent of the banana supply in Japan. EILER said that steady supply of bananas would not have been possible without the blood and sweat of more than 18,100 Filipino workers producing 19,000 boxes of banana daily. Sumifru reportedly earns P19 million gross daily income but it pays its workers only P365 per day, an amount that is not even close to the company’s capacity nor to the amount needed for a family of five to live decently. The post Include Sumifru workers’ woes in Japanese official’s agenda, Duterte told appeared first on Bulatlat.